Crest Precast Concrete of La Crescent MN installed barrier for secure storage around a power plant. This project involved 6 million pounds of precast concrete, each block approximately 11 tons each. We also have security barriers, planters and bollards for facility protection with plain finish, exposed aggregate or colored surface options. If you're going to purchase barriers - call Crest! From design through delivery, you can count on Crest. 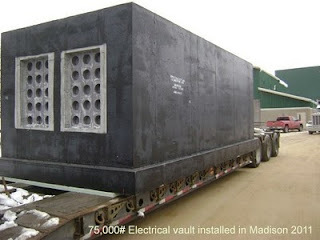 Crest Precast Concrete of La Crescent MN installed a 75,000 pound Electrical Vault in Madison in 2011. Crest Precast offers vaults, manholes, hand holes and specialty items for underground electrical, gas and communications. Crest is one of the largest providers of vaults for power plants, universities and airports. When you visit the page above you will see many different vault configurations available. We have created custom designs for many applications. Crest Precast Concrete offers freestanding Tee walls for Corn & Hay silage and they may be used for storing any bulk material. These sections are manufactured with 6,000 psi concrete and sections are solid thru out to provide a very durable product. Units are reinforced, engineered and manufactured to the highest standards. 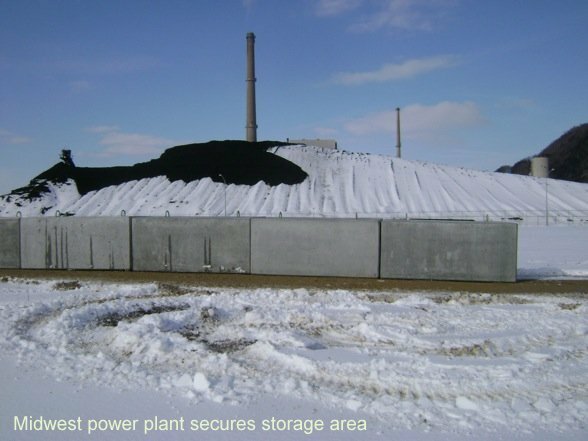 Note: Bunker silos are constructed to be filled to the top with a only a small angle of repose, overfilling can be dangerous and also exceed engineering. Other dangers of bunkers can be from tipping of equipment while packing, and cave in of materials while unloading and undermining the stack. Only educated operators should perform work in and around bunker silos.